Please have your invoice / order number ready and fill in the following form. 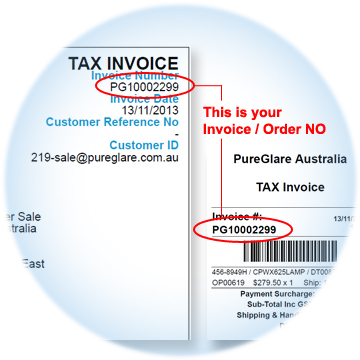 Your tax invoice will look like the example shown on the right. Once your request is approved, we will email you an URL to print out the RA form. The goods return address will be located on the top of the RA form. Please return the goods with the copy of your tax invoice and completed RA form. You are entitled to return a product if you believe that there is a problem. You are generally responsible for returning the product if it can be posted or easily returned. You are entitled to recover reasonable postage or transportation costs from us if the product is confirmed to have a problem, so keep your receipts. The return shipping with COD or return shipping via high cost express will not be accepted. If the product is found not to have problem, you may be required to pay the transport or inspection costs. An estimate of these costs should be provided to you before the product is collected, and the costs must not be inflated in an attempt to deter you from pursuing your claims. To obtain a refund the consumer should return the goods within a reasonable time frame after goods receive. Any refund will be given to the customer via the same payment method the customer used to make the original payment. For more information, please read our Exchange, Warranty & Refund Policy carefully before you return the goods. If you have any questions about our products, please fill in the following online form and we will reply to you as soon as possible. PureGlare is Australia's prime source for replacement projector and TV lamps. Our warehouse / service centre is located in Sydney, NSW, Australia. We hold our own large inventory of replacement projector / TV lamps which enables us to provide rapid free deliveries national wide and low cost deliveries to New Zealand. You can also visit us for pick ups after we have arranged a time for you. We would like to extend our thanks to all our customers for their support, and wish you a happy and safe holiday season!